SAN FRANCISCO (KABC) — At least 19 people were arrested during an anti-Wall Street protest in downtown San Francisco after many of them blocked the entrance to Wells Fargo’s corporate headquarters. The demonstration turned violent when protestors smashed windows at a car dealership and took over an abandoned hotel. The protests were one of many Occupy Wall Street-related demonstrations around the country demanding that banks end evictions and foreclosures. Eighteen people were arrested for trespassing, and another person was arrested for apparently being in possession of a police baton after a brief clash with officers. A spokesman for Wells Fargo said that the bank is doing its part to help those facing financial hardships. “We understand that Americans are demanding more from their financial institutions during this economic recovery,” spokesman Ruben Pulido said. As police in riot gear and private security guards tried chasing off protesters, many spilled onto the streets, often causing traffic to be rerouted or come to a standstill. 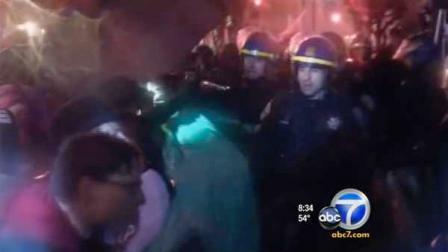 via Occupy protesters arrested in San Francisco | abc7.com.